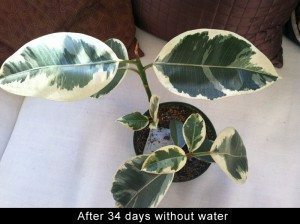 Before leaving for my tour of East Coast horticultural trade shows, I watered a few potted house plants with Root Zone and sprayed them with Moisture-Loc. 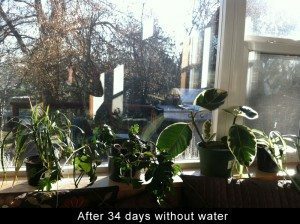 More than a month later I would return to see how they fared without water. Keep reading to find out the results. 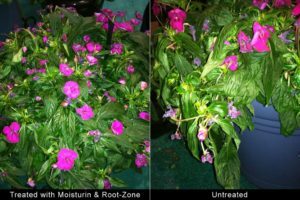 Meanwhile, on the first full day of the New England Grows trade show in Boston Massachusetts several growers agreed to let us treat their display plants with Root Zone and Moisture-Loc. They iced the plants next to them as they usually do for trade show stress. I took the pictures below the very next morning. What a difference! You can click the images for a closer look. 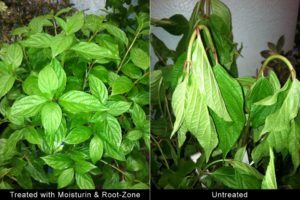 It only took one day to see the benefits of Moisture-Loc and Root Zone antitranspirants in action. But the biggest challenge still awaited me when I returned home after more than a month away. Now I’m back and here’s what I found. 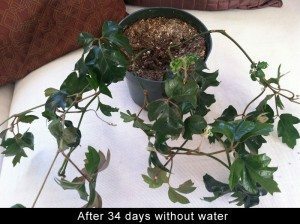 I watered these plants 34 days ago before I left home with Root Zone and sprayed them with Moisture-Loc. They were in small plastic pots, in the window sill in a very dry climate. This is how they looked this morning. The soil was dry as a bone and the plants looked as good as the day I left home. I’m more than impressed with the results!!! 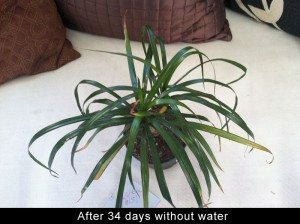 To find out more about what Moisture-Loc and Root Zone can do for you, check out our Products Page.